"This is a beautiful and delicious salad that was popular in our salad bar when we had our restaurant. Red and green vegetables are mixed together with the imitation crab, and then tossed with a light and lemony dressing." In a small bowl, whisk together mayonnaise, lemon juice, sugar, white wine vinegar, garlic, Worcestershire sauce, salt and pepper, and chile sauce. 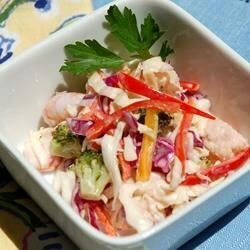 In a large bowl, combine cabbage, broccoli, bell peppers, and crab. Toss mixture with dressing. Cover, and refrigerate until ready to serve. This was a nice light lunch salad, but next time I will use real crab meat instead of imitation! Fabulous! I made it today, also adding chopped carrots and green onion, and shrimp. You could add a lot of other veggies, too, I imagine. Thank you! Just tastes amazing! Used less mayo & more hot sauce. Leftovers taste great in a pita! Used prebagged cabbage with no red cabbage and added more tabasco pepper sauce. Great flavor and kudos all around. Thanks for sharing.